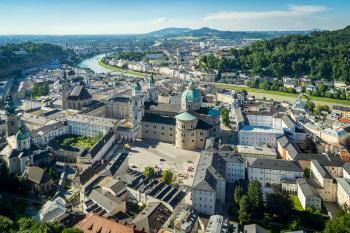 The Historic Centre of the City of Salzburg with its world famous baroque architecture is one of the best-preserved examples of an European ecclesiastical city-state. Furthermore, Salzburg is historically associated with music and festivals. Its most famous son was the composer Wolfgang Amadeus Mozart. Despite the tourists (and there are lots of them, from every corner of the world), Salzburg is quite a cosy city. The historical center is small and has retained its original medieval layout with narrow roads. These streets are littered with more or less historical shops and many many churches. Every morning at 7 a.m. their bells all ring at the same time, you'll need no alarm clock here. Like Graz that I visited earlier this trip the city is no match for Vienna however in regard to its monuments. I walked around Salzburg during an afternoon and one morning. First I ended up at St. Peter's Abbey, a lucky first choice as it possibly is the most atmospheric place in the city center. Across the square lies the Salzburg Cathedral: a large and Italianesque construction. The Salzburg Museum was my last stop for that day: I enjoyed an exhibition about Ars Sacra (medieval art) and early paintings of Salzburg. Before I made my way back home via rail to Munich and then flying back to the Netherlands, I went up to Hohensalzburg fortress. Entrance (including funicular both ways) now costs 11 EUR. Which is quite a lot for an enormous but otherwise not that interesting fortification. I wasn't feeling well that day, so I just slowly looked around for awhile. And finally decided to walk back down to enjoy the view over Salzburg's church towers once more. We visited Salzburg at the end of December, hoping for snow. While this was not the case, Salzburg was still an enjoyable and beautiful city with a cosy Christmas atmosphere. Next to the most visited sights (Hohensalzburg fortress, Mozart's Geburtshaus, ...), Salzburg is also full of magnificent churches. We particularly liked the St. Peter, the Kollegienkirche and of course the Dom. In case you buy a ticket for the Dom Quartier (Salzburg's cathedral museum complex - highly recommended), you will be guided through the Dom at organ level which provides a spectacular view on the Dom's inside and ceiling. In case you go to St. Peter, also make sure to visit the cemetery and catacombs. 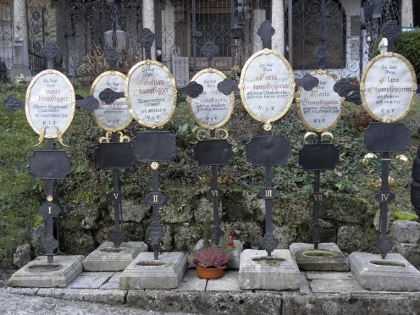 'Cemetery enthousiasts' could also visit the one at the Sebastianskirche with a large number of graves and tombs full of details. Hohensalzburg fortress probably has the best city sights, but those from the Museum der Moderne and a bit further on the Mönchsberg, as well as from the Kapuzinerkloster are also very nice. 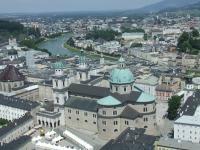 Salzburg is of course also known for the Salzburger Festspiele. In principle every day at 14h guided tours through the different festspielhäuser take place. Especially the Felsenreitschule with part of the stage carved out of the rock is worth the tour. Finally, make sure to have a look at the Mirabell's palace's baroque staircase and marmorsaal. Although the palace currently houses the city council and is therefore not open to the public, you can take a peek into the marmorsaal without problems. Just the name ‘Salzburg’ is enough to conjure up images of European modern fairytale – majestic churches, colourful facades, quaint shops on quiet streets, narrow bridges over a wide river. Even if you have never been (and I hadn’t until now), you probably have a feeling of Salzburg, regardless of whether you have a mental picture. The Austrian city is one of those places that’s talked about as an iconic destination for a trip in this region – and, I can tell you, it’s justified. Salzburg is beautiful from the approach, beautiful from above and beautiful from within. As a whole, it creates a consistent panorama of style. Zoom in further and each building, plaza, restaurant is captivating on its own. The geographer Alexander von Humboldt (perhaps apocryphally) thought highly enough of Salzburg to consider it one of the three most beautiful regions on Earth that he'd seen. After visiting Salzburg in the fall of 2003, I'd have to agree the city is very beautifully situated in the Austrian Alps. 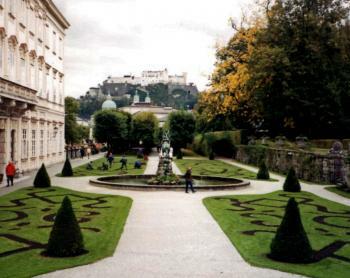 Salzburg is easy to explore, and, not surprisingly, there are many tours offered for those who want to see sites associated with "The Sound of Music", including the Mirabell Palace and gardens. Alternatively, one can learn about the musical history associated with native son Wolfgang Amadeus Mozart, whose birthplace and residence are both open for tours. As an aside, it was while I was in Salzburg that a new governor was elected in California, and I was amused to hear residents of Salzburg speak so proudly of another native Austrian son who had done well in the world! The Salzburg cathedral and the Petersfriedhof (St. Peter's Cemetery) are other memorable sites in the Old Town, and I highly recommend visiting the Hohensalzburg Fortress above the town, which offers the best views I found of the city and surrounding regions. Logistics: Salzburg is easy to explore on foot, and the Hohensalzburg Fortress can be reached by either funicular or a walk uphill. I loved the long walk up the hill to the fortress, and another long walk up another forested hill to Stefan Zweig's house. I have never been in a city with so many squares opening onto each other. The towers and squares charmed me. 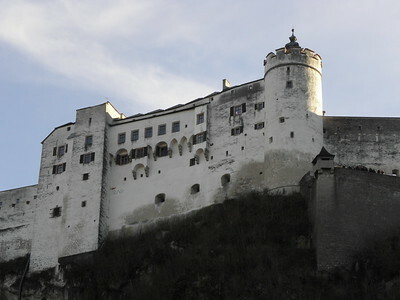 The marionette show of a Mozart opera, "The Magic Flute," and a string quartet concert at the fortress were highlights of Salzburg, as was the view of the fortress from the Mirabell gardens. I also enjoyed a cheesy four-hour bus tour of the places where the Sound of Music was shot, including a pretty Salzkammergut village where Maria's wedding was filmed. We had a short stepover in Salzburg in Winter 2010. The main Gasse was covered in snow and the views on the city beautiful. Definitely not the last visit. I visited this WHS in April 2014. 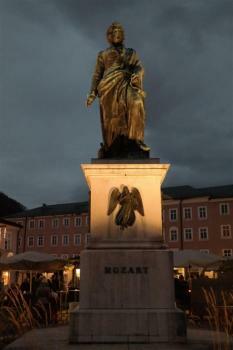 Salzburg is popular as Mozart's birthplace and the place where the Sound of Music film was shot. Therefore it is always pretty crowded, however if you start exploring the city early in the morning you are likely be there before the tour groups arrive. The urban landscape is best admired from the new bridge with padlocks over the Salzach river or else from the Hohensalzburg Fortress. From these viewpoints, I could easily spot the various church steeples so it was very easy to find my way through the streets adorned with intricate guild signs. 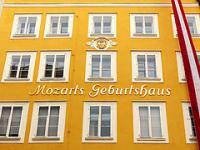 The Mozart House is worth a visit although quite expensive. The highlight of my visit though was the Benedictine Abbey of St. Peter with the catacombs and graveyard - a perfect place for some peace and quiet before enjoying a good Sacher cake in one of the many cafes. This is a film I made about Salzburg in Austria (Swedish voice-over with English subtitles). First up, I've never seen the Sound of Music. This put me out of kilter with the large crowds in the city centre; this was by no means a bad thing as it allowed me time to discover the wonderful charms of Salzburg without feeling like I was part of some massive coach trip. I was a little apprehensive that the large numbers of tourists may have taken away from the character of the city, but I needn't have worried. There were enough charming distractions to keep me entertained. My first highlight was stumbling into St Peters Church and graveyard at the end of my first evening, it was delightful little misstep that led me to the catacombs at the base of the hill providing some cool shade on a balmy evening. Having viewed the fortress from the base of the hill I decided it was time to have a hike up, and I was rewarded by magnificent views of both the city and the surrounding mountains over a nice cold weissbier as the sun set. An evening visit to some kaffehauser and beer gardens ended with a wonderful stroll through the Mirabel gardens accompanied by the singing of children on their way home from a rendition the Sound of Music. The next day gave me time to revisit some of the highlights, climb a few more hills and settle in for a few more Melanges; a thoroughly enjoyable way to spend any day. I had decided to save a little money by staying in a hostel (perhaps I am just getting a little too old for them now) and this inadvertently led me to my real highlight of the city. Wanting to leave my thoroughly friendly but energetic Brazilian roommates to discuss the previous night's adventures I was left with a few options. The idea of sitting in the hostel bar watching Maria run around after the von Trapp children on a constant loop forced my hand in making me venture out. I was rewarded by magnificent views across the river as I wearily made my way to the Augustiner Bräustübl where things got even better. I don't think I could design a better place to spend an evening than this: a glorious monastery setting, very affordable beer fresh from the vats, hearty food, a bakery, the constant murmur of people conversing, a giant beer garden and a wonderful booth to settle into to write up my adventures, perfect. Salzburg is very touristy, however as with most places there is a very justifiable reason for it as the city is rather magnificent. Some impressive sites dot the wonderful centre and are accompanied by some really tasty food and drink, with the Augustiner Bräustübl being a real highlight. Well worth a couple of leisurely days, even if you haven't watched the Sound of Music. Salzburg was a lovely and very touristy city! I think we encountered more crowds here than anywhere else in Austria! Perhaps the sense of crowds was greater due to how the town is set up. 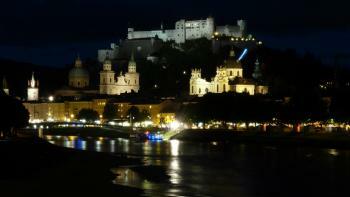 The Hohensalzburg fortress sits above everything and offers terrific views. The town itself felt rather quaint and the Mirabellegartens were lovely. Music is everywhere and there was a very special mood in the air here. A lovely place to spend some time! Although very touristy I enjoyed my visit to Salzburg. The highlight was the Hohensalzburg fortress from where the views were stunning. It was in my opinion overpriced: E7.40 to walk up or E10 to ride the funicular. Also interesting was St Peter's monastery and the Nonnburg monastery. Trolleybuses 3, 5 or 6 from the station to the Rathaus saved a long tedious walk. 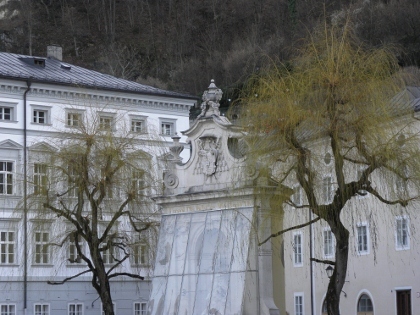 Visited Salzburg over Christmas weekend of 2008. We were looking for a place with a good holiday feel to it. Salzburg delivered. A culinary must while there- white hot chocolate. 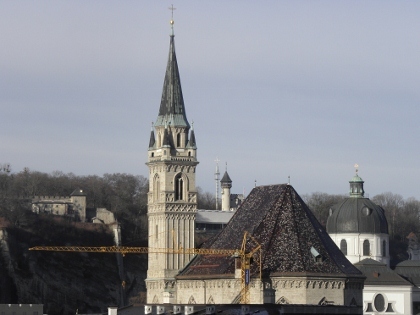 Visit the Festung and walk along the hilltop for some great views of the surrounding area. Place to stay- Ramada. Sounds bad but it is fairly new and very trendy. Much nicer than the ones you might know in the USA. We went to Salzburg in 2005 for 5 days. It is very beautiful. We stayed across from Mirabel Gardens which is wonderful to walk through. The museum of Mozart (not his birth house) was informative. Definitely worth going to the Sacher Hotel for some desserts. If you want something a bit different, you can go to the Red Bull Hangar 7. Formula 1 cars and aircraft on display and a super-cool bar above the futuristic glass hangars. Not bad for a salt mining town. I thought it struck a fine balance of modern convenience and Old World charm. Europe as it should be. Although often obscured from view by its proverbial drizzle, the old city and especially the fortress of Salzburg are a great sight. The latter is a castle as it should be, and the town itself is charming and well-preserved, even though it is often crowded with tourists and all the Mozart stuff can get on your nerves after a while. Still, it is one of Europe's great townscapes. Synonymous for me with Mozart and music (the summer festival is a real treat), I was pleasantly surprised to find how beautiful the city of Salzburg is as well. The wrought iron shop signs, winding streets, and imposing castle on the hill typify the quaint Austrian town. Interestingly enough, my visit to Salzburg coincided with the filming of a Bollywood film in the Mozartplatz; a touch of India in Austria! Designed by Johann Bernhard Fischer von Erlach: Kollegienkirche etc. Horse Stables: The one next to the festival halls and the Neutor served the court stables that - which actually were what are now the Festival Halls, thus the name "Hofstallgasse" or "Court stable lane" for the street. Oldest companies: "Stiffskeller St Peter" within St Peter,s Archabbey. The restaurant first was first documented as operating in 803. Claims to be oldest Inn in Central Europe . Naser ed-Din Shah: "It is a handsome city, with a pleasant climate, and situated by the side of a wooded mountain, having a population of fourteen thousand souls. Tliis is the place where the thii-d Napoleon had a meeting with the present Emperor of Austria. It has a famous salt-mine. Hitler was here: Hitler journeyed to Salzburg on 5 February 1914 for medical assessment. 506 Community Members have visited.